Meridian G55 5 Channel Power Amplifier, beautifully engineered with a glass and metal exterior to complement the G65, provides the muscle and finesse to your passive loudspeaker system. The G55’s robust chassis contains five identical 100 watt amplifiers based on Meridian’s award winning DSP8000 amplifier technology. 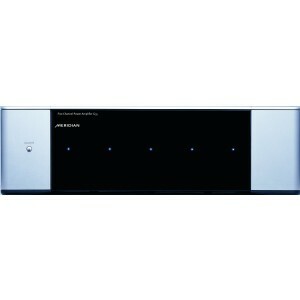 When combined with a Meridian Surround controller, such as G65, this multi-channel amplifier will form the core of a 5.1 high performance analogue theatre system.